No hot water? Looking for advice on how to fix common hot water problems yourself? Need a local plumber now for emergency hot water repairs? Serving you from locations throughout Sydney, Canberra and Newcastle. We know how inconvenient it is when your hot water system isn’t working. That’s why Australian Hot Water is available 24 hours to arrange a same day service for your hot water system. To possibly save you time and money, we’ve put together some troubleshooting tips that might help you address problems with your hot water heater. If your problem persists, call Australian Hot Water for an emergency plumber same day service call. Remember, if you aren’t confident to check your hot water system safely, it’s always recommended to use the services of a professional. Call us to book a call out with one of our fully authorised repair technicians. In a plumbing emergency you can always count on our same day service. With centres in Alexandria, Belmore, Caringbah, Leumeah, Moorebank, Mona Vale, Seven Hills, Fyshwick in Canberra, and Cardiff in Newcastle, Australian Hot Water can help get your hot water flowing again quickly and reliably. We also have licensed agents in Melbourne, Brisbane, Gold Coast and Adelaide. ELECTRIC: Check the fuse or circuit breaker on your switchboard. If the fuse is blown, replace with correctly rated fuse wire. If the circuit breaker has tripped, reset to “on.” In most cases, a blown fuse or tripped circuit breaker indicates a problem that should only be serviced by an authorised service representative – call Australian Hot Water to book a same day service appointment. Never remove any electrical covers to expose bare terminals or wiring. GAS: Check to see if the pilot light is still alight. If not, most storage types of gas water heaters will have step by step lighting instructions on the inside of the front cover panel. Follow the procedure carefully as instructed. If you are unsure or not confident with the procedure, do not attempt to light and call Australian Hot Water for same day service from one of our authorised service representatives. ELECTRIC/GAS: Check to see if the isolation valve located at the hot water system is turned to the “on” position (usually anti-clockwise). It may have a black knob or a normal tap type head and is typically located at a lower level than the water heater inlet. Do not touch any other valve associated with the water heater. ELECTRIC/GAS: A leaking cylinder usually means a new hot water system is required – call Australian Hot Water to arrange a replacement. So that you can continue to use other household appliances, we’ve provided instructions for turning off water supply to the hot water system. Turn the water off at the isolation valve, usually at a lower level near the water heater inlet. For electric systems, turn the power off at the meter box – the fuse switch or circuit breaker will usually be marked as “Hot Water,” “HWS” or “Water Heater.” For gas systems, isolate at water heater by locating the gas supply valve which is usually a yellow lever (older installations may be green or black). Turn the valve a quarter turn clockwise to isolate the gas. Instructions on how to operate the valve will be on the water heater labelling. Lift the lever carefully to allow water to flow from the overflow pipe – make sure other people are clear of the pipe drain as the water may be hot. Allow water to run from the overflow pipe for several seconds then ease the lever closed. Water should cease to flow. 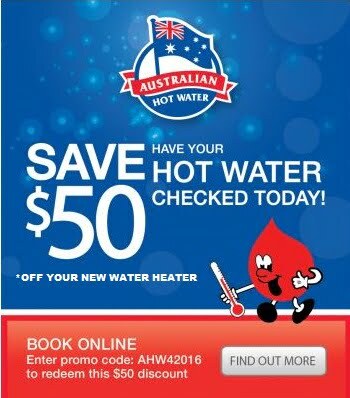 If water continues to flow, call Australian Hot Water to book one of our authorised service representatives.